Russia’s first updated Yasen-class submarine, the Kazan, is now sailing its maiden voyage in the White Sea. After a nearly ten years construction period, the «Kazan» (K-561) sailed out from the yard in Severodvinsk on Monday. The Barents Observer has been allowed to republish photos from the start of the voyage, taken by local photographer Oleg Kuleshov. «Kazan» is the second of the Yasen-class nuclear powered submarines, but the first modernized vessel. When the first vessel of the class, the «Severodvinsk» started to sail out in the Norwegian Ocean and the North Atlantic, one of the U.S. Navy’s top submarine officers, Rear Admiral Dave Johnson, told USNI News that he was really impressed by the subs capabilities. «We’ll be facing tough potential opponents. 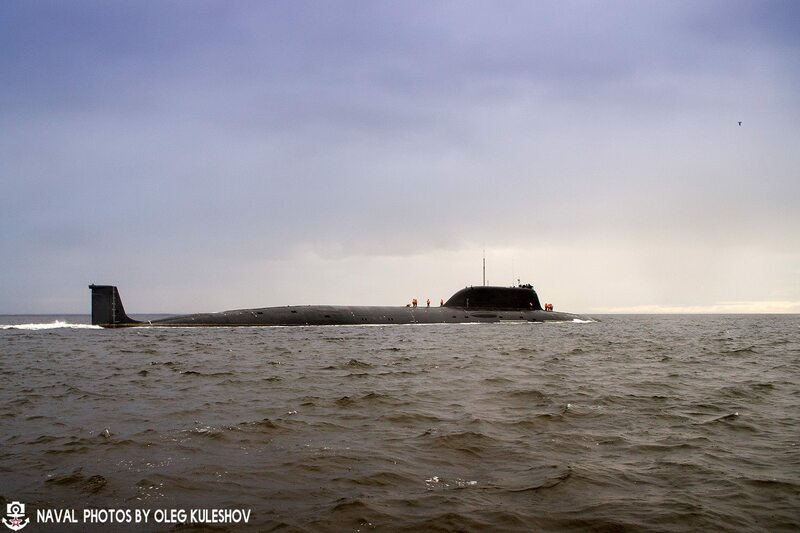 One only has to look at the «Severodvinsk»,» Russia’s version of a nuclear guided missile submarine,» he said. Johnsen is executive officer for the Naval Sea Systems Command’s program. The «Kazan» is built with low-magnetic steel to better evade detection. When the submarine left Severodvinsk on Monday, it is heading out to deeper parts of the White Sea, possible the Barents Sea for sea trails. «Kazan» is expected to be launched for active service with navy next year, but is is unclear wether it will sail for the Northern Fleet, like «Severodvinsk», or if it will be transferred to Russia’s Pacific Fleet. The «Severodvinsk» is based in Zapadanya Litsa, the Northern Fleet’s westernmost submarine base on the Kola Peninsula, some 65 kilometers from the border to Norway. Additional to the «Kazan» and «Severodvinsk», another five Yasen class submarines are currently under construction at the Sevmash yard in Severodvinsk west of Arkhangelsk. «Kazan» was laid down at the yard in July 2009, and put on water in March last year. The class will take over the roles of the Akula- and Oscar-class submarines. The submarine is 140 meters long and has a displacement of 8,600 tons. It is powered by one reactor and can dive to about 600 meters. It carries both cruise missiles of either the supersonic Oniks type or the sub-based version of Kalibr or the Kh-101. Also, there are 10 torpedo tubes on board.